dressed up like a lady: Guess who's in escrow? Sorry to keep a secret from you guys, but I have a small announcement: MC and I are closing on our new house on Friday. I mentioned in a post a while back that we'd been outbid on a house we really, really loved. It was an oddly confusing development for me at the time, because people always say that when you find your home, your intuition tells you unequivocally that you're there -- you feel it in the pit of your stomach. And I did! Well six whole weeks later, the deal fell through and we got a second chance (thanks to our realtor Ginny Hannon, who continued emailing the seller every week to check, even though she spends her winters on a sailboat in Grenada!). Now, we'll have the keys to our new home on Friday. oh my God! I'm so excited for you! Congratulations!!! Your realtor totally deserves to winter somewhere cool when she comes through like that. Yay you both! Beautiful house! You must be really happy. Congrats! I'll come out from Chicago w/ my tool-bag. Let's get that home up and going! The house looks amazing :D Congratulations! You two are one happy couple. What an amazingly good turn of events. Very happy for you both, that house is lucky to have you guys. Can't wait to see inside it! 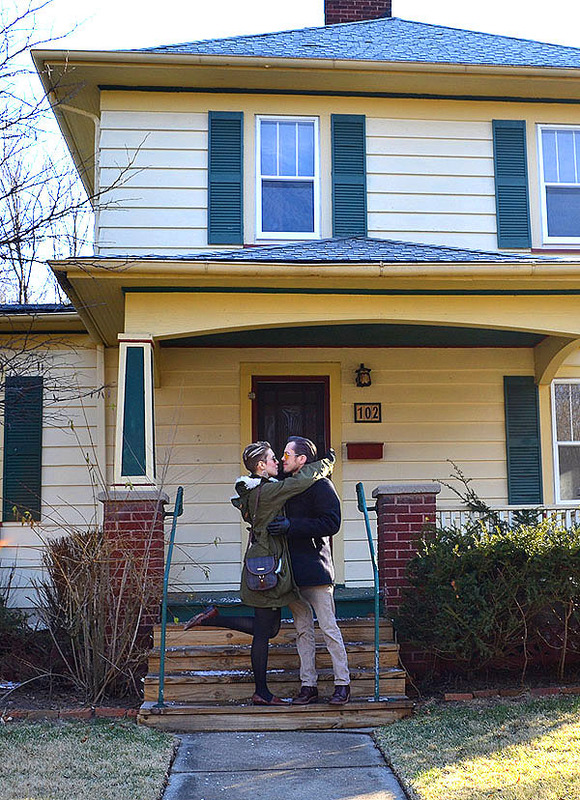 Being a homeowner is a rewarding (and hectic!) experience. I have been a homeowner for about 10 years and it's been an interesting ride for sure. Unfortunately this is not our dream home, everyday I daydream about our next house and how wonderful it will be. We just have to be patient and wait for the market to improve so we will be able to sell. Good Luck with the home repairs, decorating, and the move!! It's such a beauty!!! I'm really happy for you two!!! Was the house necklace a gift from MC related to this? Oh, what a beautiful house. I'm so happy for you guys, congratulations! CONGRATULATIONS!!!!! The house is absolutely darling!!!! You two are so amazing and I wish you many happy wonderful years in this picture perfect house. YAY!!! I can't wait to see and hear more about it. SO EXCITED FOR YOU!!!! This is such a grown-up moment and it's a great event in the history of you and MC. I'm smiling big for you, and I can't wait to hear more.